The cost of a traumatic brain injury involves more than medical expenses and lost wages – it also involves a cost in terms of quality of life. In order to determine the financial impact of a traumatic brain injury, the law office of The Orlow Firm consults medical experts, economists, and life care planners. We take into consideration costs associated with future surgery, physical therapy, pain medication, in-home nursing care, and lost wages. We also present “before” and “after” photos in order to explain to jurors the impact of your injuries on you and your family. When insurers attempt to underestimate costs associated with traumatic brain injuries or try to avoid paying compensation for pain and suffering, we provide detailed medical evidence specifying current and future needs created by our client’s brain injury. It’s not uncommon for negligent employers, property owners, or car and truck drivers to deny responsibility for causing an accident. At The Orlow Firm, our attorneys consult experienced accident investigators, safety consultants, design engineers, and other professionals in exposing negligence and unsafe conditions that cause accidents. Although OSHA standards apply somewhat differently in New York than elsewhere, safety regulations determine everything from how scaffolding must be handled to what sorts of safety gear must be used to how work sites are to be secured. We expose safety violations and hold employers and property owners financially accountable for our client’s injuries. 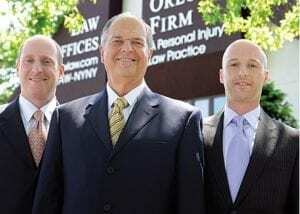 We understand the financial and medical issues involved in traumatic brain injury cases. We also understand the long-term effects of a severe concussion or coma in children and adults. While the consequences may not be immediately evident, what appears to be a mild or moderate head injury can result in memory loss, chronic pain, cognitive impairment, and neurological disorders. To schedule a free consultation to discuss your case, call (646) 647-3398 to speak with a New York City traumatic brain injury lawyer at The Orlow Firm today.